In New York’s Adirondack mountains, we say we have five seasons. The time between the end of winter weather and actual warm spring is known as “mud season.” During mud season, the snow is melting, it’s still cool, nothing is growing, and the ground is mush. We are discouraged from hiking off the trails and in the higher elevations to avoid trampling the tender sprouting plants and disturbing nesting wildlife. I haven’t spent much time on the mountains over the past couple of years, but this year my body feels ready to get back to it. 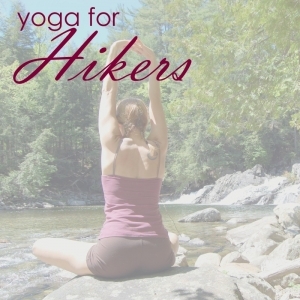 Since I’m limited to the flatter trails for now, I’m revisiting the yoga asanas that support my body before, after, and between hikes, and looking forward to the view from a summit in a couple of months. Practicing these energizing poses at the trailhead before hiking will loosen stiff joints, warm your muscles and improve circulation. To begin, stand in mountain pose and take a few deep breaths while you enjoy the sunrise. From mountain, inhale and raise your arms overhead. Exhale and fold forward, reaching towards the ground. With your knees slightly bent, inhale and lift your torso, leading with your heart, and raise your arms back overhead. Keep arms well apart as you lift to open your chest. Repeat the down and up flow three to ten times. Step your right foot forward and lift your arms overhead with an inhale. Exhale and fold your torso over your right leg, bending your right knee slightly if necessary, and drop your hands to ground (or your shin to modify). Take at least two breaths, then inhale and lift, leading with your heart. Repeat with your left foot forward. Interlace your fingers, turn your palms out and lift your arms overhead. Take at least two breaths while you lift your ribs. Exhale and rotate your torso to the right. Inhale back to center. Repeat to left. Exhale and bend your torso to the right, stretching your left side. Inhale to center. Repeat to left side. Drop your arms with an exhale. Step into a straddle and turn your right toes to the right side. Stretch arms out to sides at shoulder height. Bend your torso to the right and reach your right hand to your leg and your left hand overhead, stretching your left side. Hold for at least two breaths, then lift, change your feet, and repeat to the left side. Standing with your legs in a straddle, toes forward, inhale and reach your arms to the sides, about shoulder height. Exhale and fold forward, leading with your heart, and reach your hands to the ground under your shoulders. Inhale. Exhale and twist your torso to the right, lifting your right arm towards the sky. Inhale your right hand back to the ground. Repeat the twist to the left. Lift your torso with an inhale, leading with your heart. Lie on your back with your arms by your sides, your knees bent, and your feet approximately hip distance apart and flat on the ground. Inhale and raise your arms up and over your head. At the same time, lift your hips. Lift until your hands touch the ground over your head. As you exhale, lower your hips and bring your arms back down to your sides. Repeat the flow three to ten times. Is it a cool Adirondack morning? Add some gentle Sun Salutations to your warm-up to build heat in your body before you head up the trail.